PHOTO COURTESY OF RANDY RICHTER | This model of the 1964 World’s Fair is in like-new condition, as it had been in storage for decades. World’s Fair Historical Society members want to showcase the model, along with hundreds of pieces of other fair memorabilia, in a museum. The World’s Fair Historical Society is looking for a place to locate a new World’s Fair museum, and one of the places it’s considering is Riverhead. The nonprofit organization boasts a collection of more than 50,000 World’s Fair artifacts dating from the first World’s Fair in London in 1851 to the present, according to its co-president, David Elliston of Hampton Bays. The most recent World’s Fair, sometimes called a World Exposition, was in 2010 in Shanghai, China, and the last one in the U.S. was in New Orleans in 1984, though Mr. Elliston said World’s Fairs aren’t nearly as popular as they once were. “Their jobs have been taken over by the theme parks,” he said, referring to places like Disney World’s Epcot Center, which is modeled after World’s Fairs of decades past. Some of his group’s items are on display at the Northwest Museum of Legends and Lore in Seattle, and others reside in members’ homes and in libraries. Mr. Elliston, who has a garage full of items himself, is familiar with Riverhead, and with history in general. He has worked at the Crescent Duck Farm in Aquebogue for 24 years, served on the board of directors at the Southold Indian Museum since 1981 and says his family on his mother’s side is descended from Lion Gardiner, the English settler for whom Gardiners Island and Gardiners Bay are named. 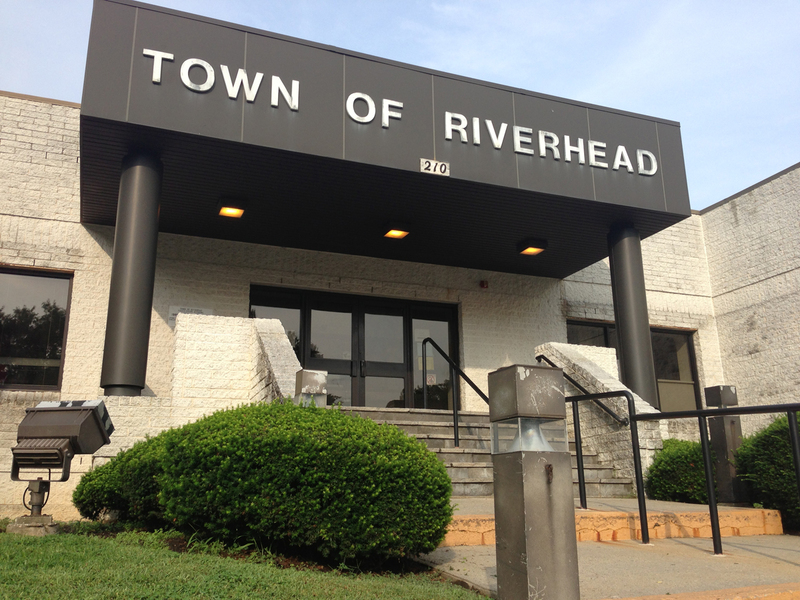 Mr. Ellison acknowledged that historical society members have yet to talk to any town officials or real estate agents in Riverhead, but said they are hoping some publicity might draw property owners to them. The group also like the idea that it’s near Queens, the site of the 1939 and 1964 World’s Fairs. But the group’s founder and other co-president, Randolph Richter of Denver, Colo., said the group doesn’t have a lot of money and that members are actually hoping someone might donate space for the museum. Riverhead Town has actually been trying to find a tenant for the vacant Railroad Station on Railroad Avenue, which itself is a piece of history at 101 years old. The building is supposed to be occupied, according to an agreement between the town and the MTA, but has sat empty for most of the past 10 years. The town can’t find anyone to take it — even rent-free. “It would be fun to occupy a train station,” Mr. Richter said. Ironically, a small train built by the Long Island Rail Road for the 1964 World’s Fair is kept right down the road from the vacant train station, at the Railroad Museum of Long Island. The World’s Fair Historical Society was founded by Mr. Richter about six years ago and has members all over the country, Mr. Elliston said. Mr. Richter said it was Mr. Elliston’s idea that Riverhead would make a good location for a World’s Fair museum. The group’s mission is to find a permanent location to display World’s Fair artifacts, and it prefers the New York area. The group currently uses a small display room at the Legends and Lore museum in Seattle, for which they are not charged but most of their items are in storage, Mr. Richter said. “It’s only one room and it’s pretty cramped,” he said. The main attraction on display there is a six-foot-wide model of the 1964 World’s Fair, he said. Mr. Richter said most of the World’s Fair artifacts around the world are in storage. “There’s a lot of libraries with donated World’s Fair collections, but none of them have a place to display it. It’s all in storage,” Mr. Richter said. Mr. Elliston said his mother attended the 1939 World’s Fair and had collected some items that were handed down to him, and he has been collecting ever since. There also have been some bad ideas promoted at World’s Fairs, such as improving the environment by cutting down rainforests and making fireproof clothing from asbestos, Mr. Elliston said. And there have been ironies. The Trylon and Perishere, a large metal sculpture at the 1939 World’s Fair, was billed as a symbol of peace and freedom. After the fair, it was scrapped and used for munitions in World War II, he said. The World’s Fair Historical Society can be contacted at 1-425-753-7557 or crystalpalace51.org.